The horse Bronen resting in front of the picket fence at Øygarden. Photo: Mark Purnell. 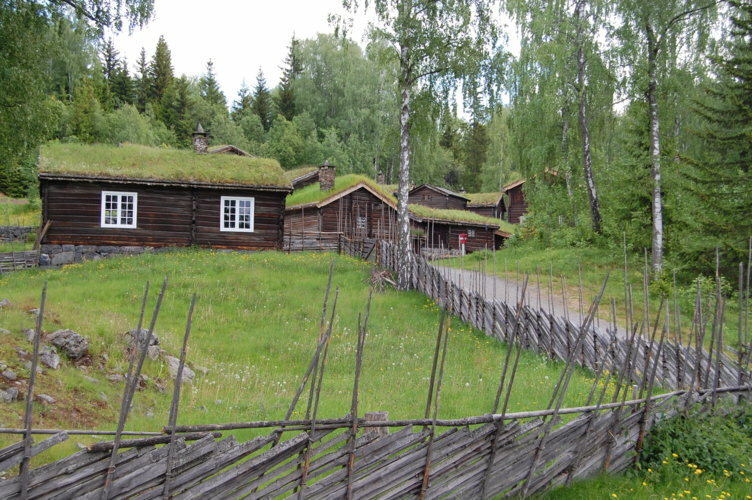 The Open Air Museum at Lillehammer is possibly best known for the houses in the Rural section. 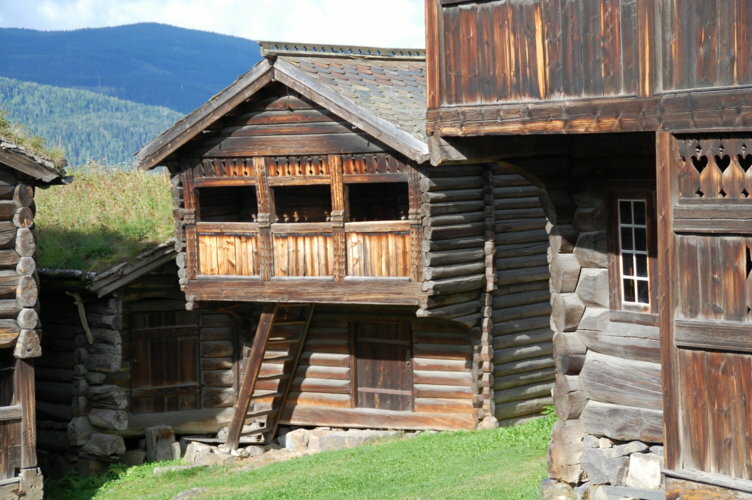 The many sunburned buildings were the homes of farmers, craftsmen and local officials. Here you will meet the culture and the way of life of the old farming community. The Rural section, as a concept, was the idea of Maihaugen’s founder Anders Sandvig. The histories of the farmer, the crofters and the local officials are preserved in the large and small farms, the vicarage and crofts. The founder of Maihaugen was of the opinion that it was important that the culture of the old villages was preserved for future generations. During the summer there is plenty of life in the Village. 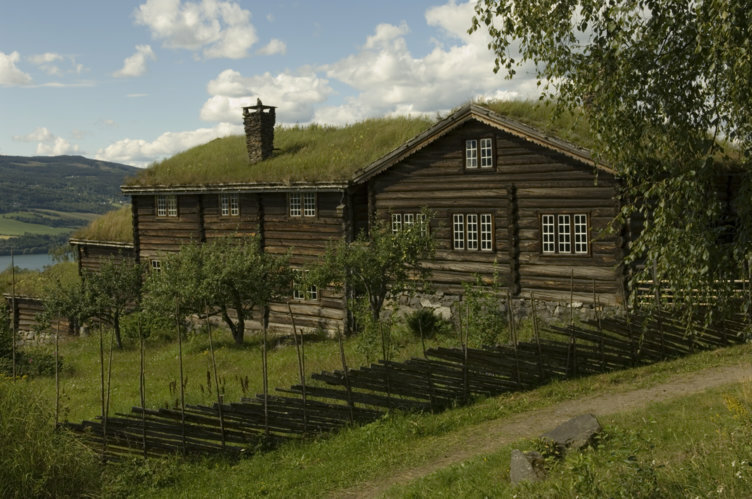 There are school lessons in Skolestua (the school room), the animals are in the pastures, smoke is rising from the chimney at Øygarden, where you can meet the farmer and his family busy at work with the harvest and the daily tasks of the farm during the 1890s. 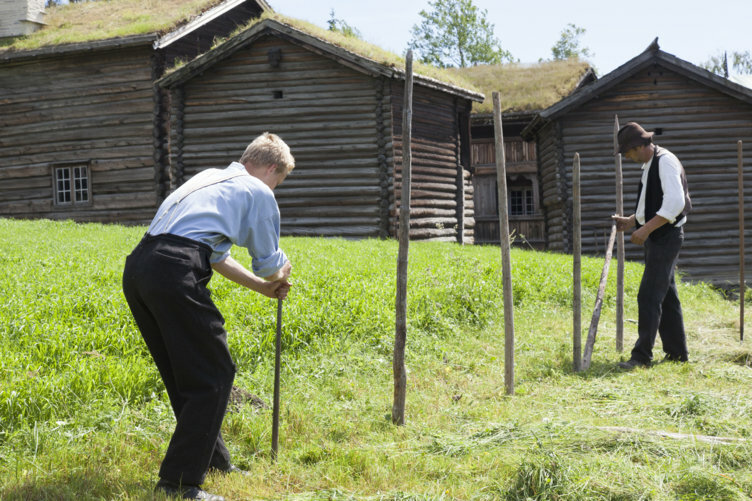 You will learn about farming life in the 1700's when you visit Bjørnstad farm. Daily during summer season there is a Wandering Theatre and guided tours of the Village. In the Rural section you will also find the church, the local school, the sheriff’s farm, military camp and the craftsman’s workshops - possibly in a room at a farm, at a crofters farm or in it’s own building. The larger farms, Bjørnstad and Jørstad are found in the lower central parts of the Village. There are a large number of spacious buildings to suit the needs of the many and varied purposes of a farm. Further up the hillside you will find the medium sized farm Øygarden. At the top of the hill you will find the smallest crofts- rydningsbruket (an area cleared for farming) and the crofters’ place. This is possibly where the village craftsmen lived. They were necessary extra farm workers when needed. Looking towards the woods and the mountain we can see how woods and fields were a resource that was used. Here you will find the fishing rampart with its fishing shelters, the forest cabin and the mountain farming village with the many mountain farms, where the animals feed in summer pastures. 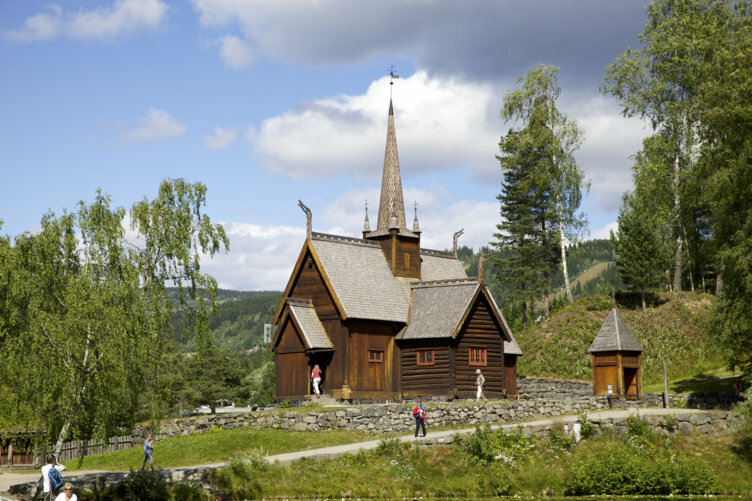 Garmo stave church is located at the top of the hill near the entrance to the Open Air Museum. It is the most striking building at the museum with its pointed tower with dragon heads on the ridges of the roof gazing out to the horizon. The church was built early in the 1200’s, but has been extended several times, most recently in 1730. This was when it was given the current characteristic cross shape. The church stood originally at Garmo in Lom. It was dismounted in 1880, but the materials were kept and the church was reconstructed at Maihaugen in 1921. 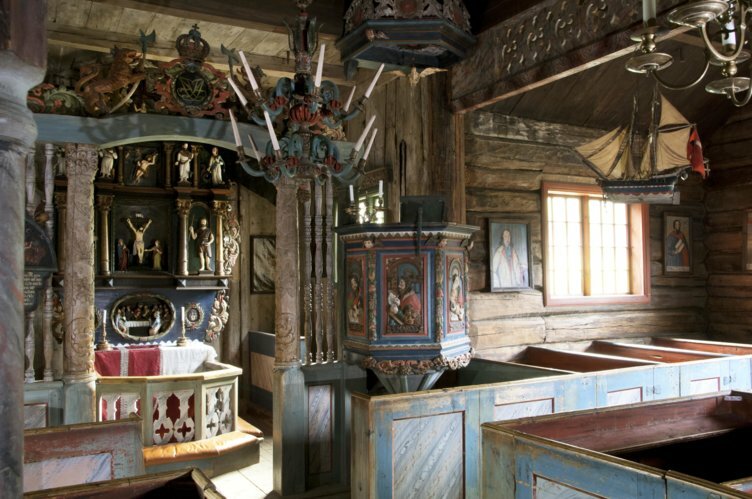 The church symbolizes the parish church of the village, and shows what a church looked like in Gudbrandsdalen in the 1700s. It carries history from the middle ages up to the present day. 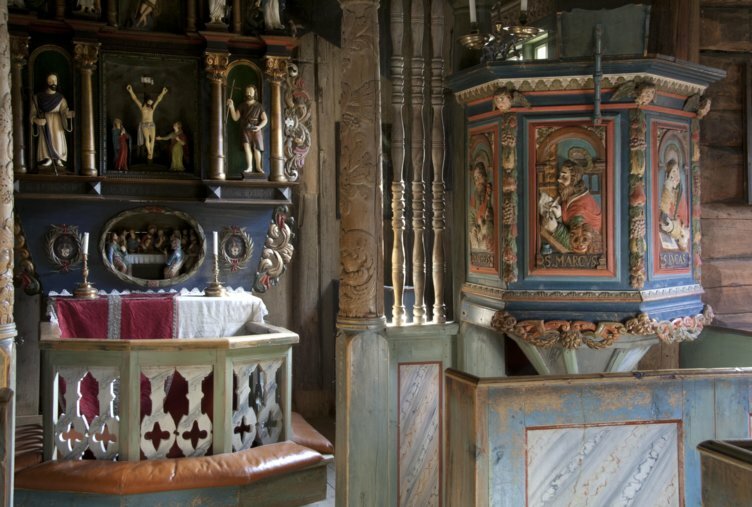 The altarpiece and the pulpit are parts of the church’s fittings that carry a message to the congregation through their motifs and symbols. The children of the village were christened in this church and the font still stands in the chancel today. On an August day in 1859, Nobel prize winner Knut Hamsun was christened there. The church was at the centre of festivities such as christenings and weddings, and this is where Christian life was maintained from one generation to the next by the church services. The church also served as the only gathering place for the village before the arrival of shops and assembly rooms. Agreements of different kinds were made here, the young people gathered here, and perhaps the fire of love was lit here too. The church is in use for services during the summer months, and on a Saturday you might find a newly married couple here. During the summer season you can meet the church guide who will give you the history of the church. 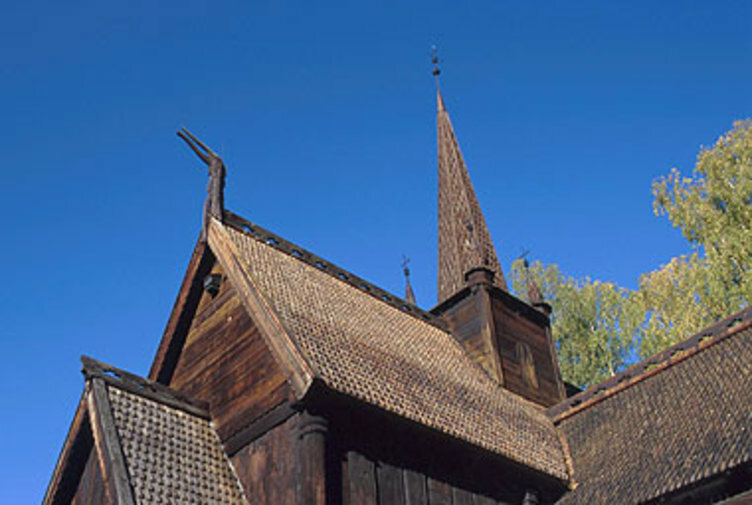 A stave church is a church built with stave technique, made up from a framework with standing pillars in the corners. These corner pillars are called staves. The framework is filled out using vertical planks that make up the walls. There were no windows in the stave churches apart from small round peep holes at the top of the wall, as seen in the chancel in Garmo stave church. Garmo stave church is one of the main attractions at Maihaugen. Photo: Mark Purnell. Garmo stave church has been extended several times, the latest during 1731, when the church was given its current shape. Photo: Maihaugen. 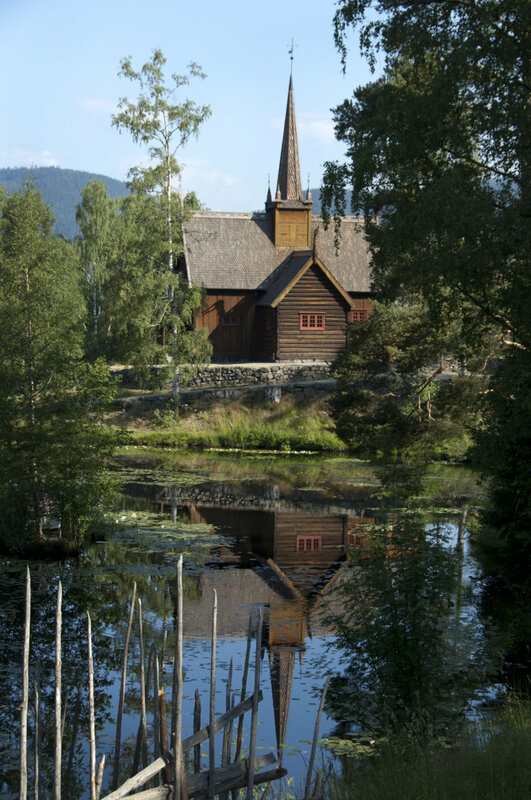 Garmo stave church at Lillehammer is located in a beautiful place by one of the small lakes at Maihaugen. Photo: Camilla Damgård/Maihaugen. 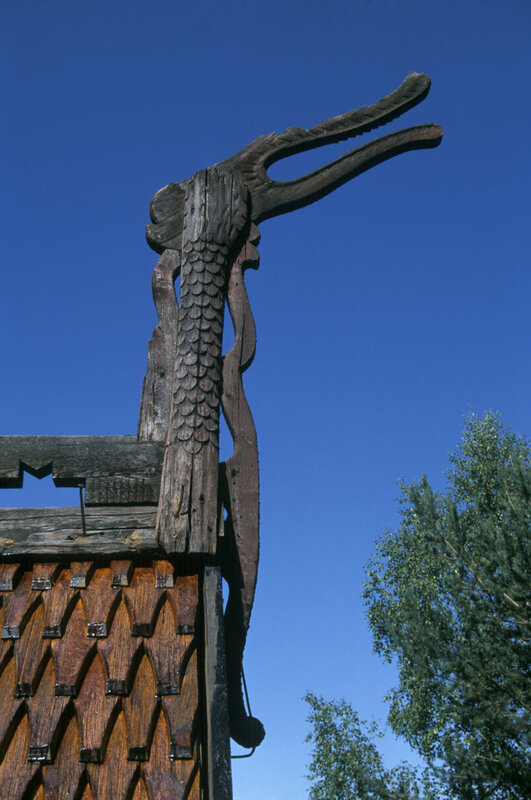 Dragon heads are used as decorations on old stave churches. Photo: Kåre Dehli Thorstad. The beautiful altarpiece and side aisle in Garmo church. Photo: Camilla Damgård/Maihaugen. The pulpit was made by Peder Knudsen Kjørsvik around 1738. Photo: Camilla Damgård/Maihaugen. 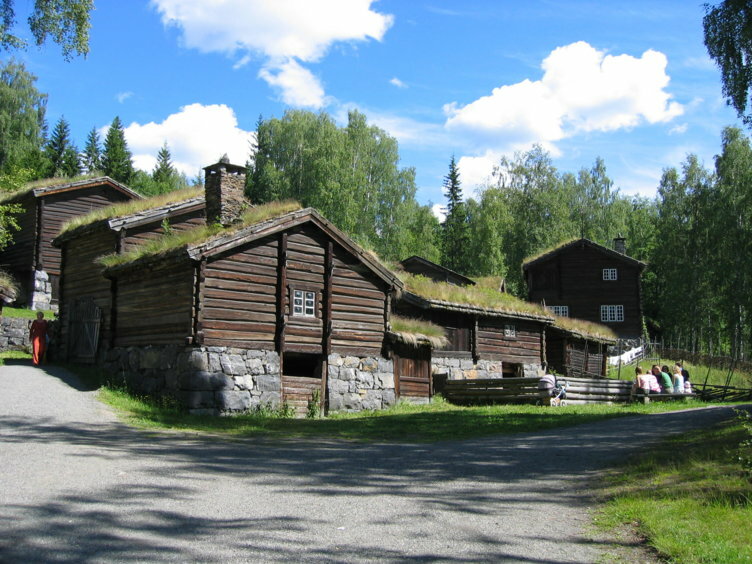 The complete farm was moved from Lalm in Vågå in 1908-1913. 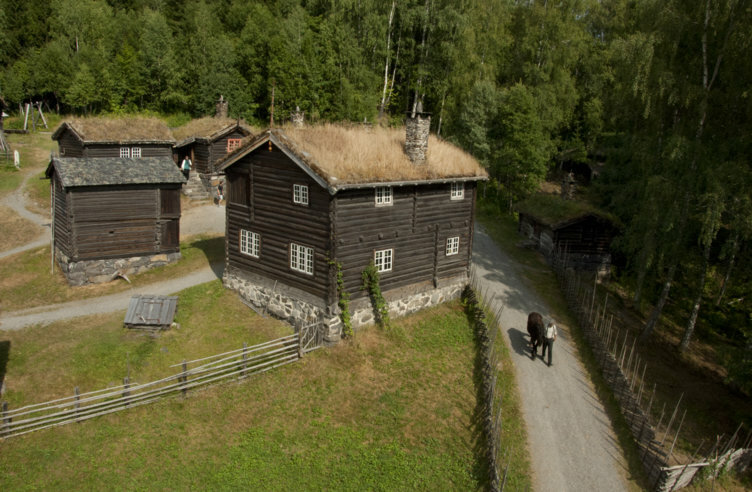 The move of this large farm is still a unique event in the history of Norwegian museums. Just a few houses have been added from other farms, where the state of the houses at Bjørnstad was too bad to enable them to be moved. Bjørnstad is a large farm from Vågå from the 1700’s. A complete farmyard was moved to and collected at the museum in order to show how a farm looked like during the 1700’s. The farm is beautifully located in the landscape, with 27 separate buildings placed around two farmyards. It looks like it has been there forever. 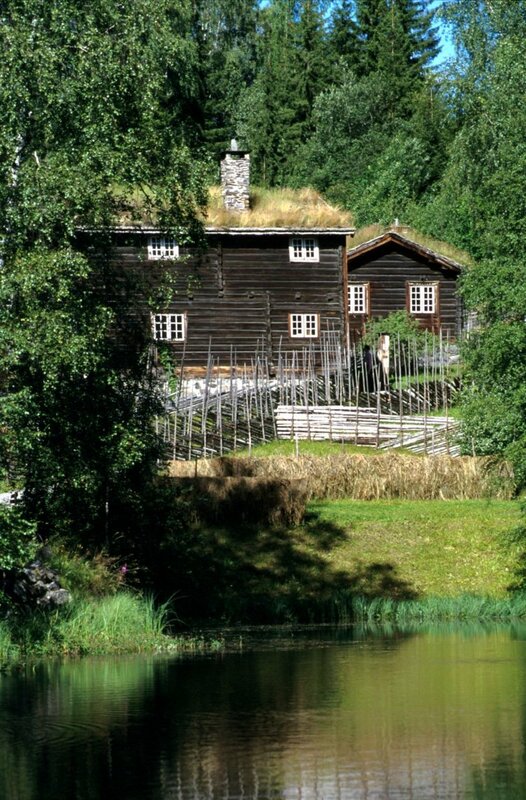 The farmhouse, Andersstua from 1777, is an imposing sight, and the furnishings are characterised by the large dresser and the long table where there is room for the complete workforce during harvest time. At the time the inhabitants on the farm, the crofters and the daily hired workers worked together side by side on the farms. On the other side of the yard you can see a similar sized farm house dating from 1787. Here the farmer’s parents and unmarried siblings lived. Around the inner yard lofts and store houses (stabburs) are located. Food and clothes for the farm were stored here, together with the grain in the granary and stacks of flatbread and rows of cured hams in the stabbur. Under one of the houses you will find “aurbua”. This is the farm’s cold cellar where butter and cheese were stored. The seed potatoes could be stored free from frost during the winter months in this house. Around the outer yard you will find the byres housing the cows, sheep and goats. The feed for all the animals was also stored here. The hay was kept in barns, whilst the large barn was used for storing the grain that was grown on the farm. This was kept there until it was threshed on the barn floor. The barn was also used for housing the servants at the farm. Buildings with a fire hazard are situated outside the yard. The cook-house and the drying rooms where they would use open bonfires for heating, and the smithy where embers flew through the room, created danger of fire. To avoid this to spread to the houses where they lived these houses were built in the outer yard. The mill, where there was water, was also located outside the yard. 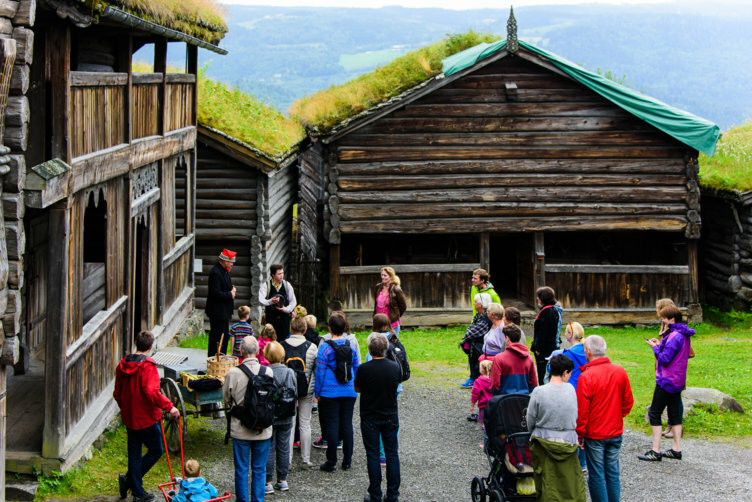 During the summer season you can meet the guide at Andersstua at Bjørnstad and hear more about the farm and the life there. The great farm of Bjørnstad is beautifully located at Maihaugen. Photo: Maihaugen. Stabburet (the food store) at Bjørnstad. Photo: Kåre Hosar/Maihaugen. Bjørnstad has 27 buildings in total. Photo: Maihaugen. Farmwork at Bjørnstad as it was performed during the 1700s. Photo: Audbjørn Rønning/Maihaugen. During the summer there is a wandering theatre daily at Bjørnstad. Photo: Ian Brodie. Øygarden from Skjåk is located on the hillside above Bjørnstad. This is a medium sized farm contsisting of 19 separate buildings. Like Bjørnstad the houses are placed around two yards, the inner and the outer yard. The steep terrain has contributed to the location of the yards and made them less evident than at Bjørnstad. Sommerstua (the summer house), the large farm house at the lowest level of the yard, was built around 1750. Here you can experience farming life from the 1890’s. Vinterstua (the winter house) is a smaller building, where the inhabitants lived during winter, when there were fewer people at the farm. 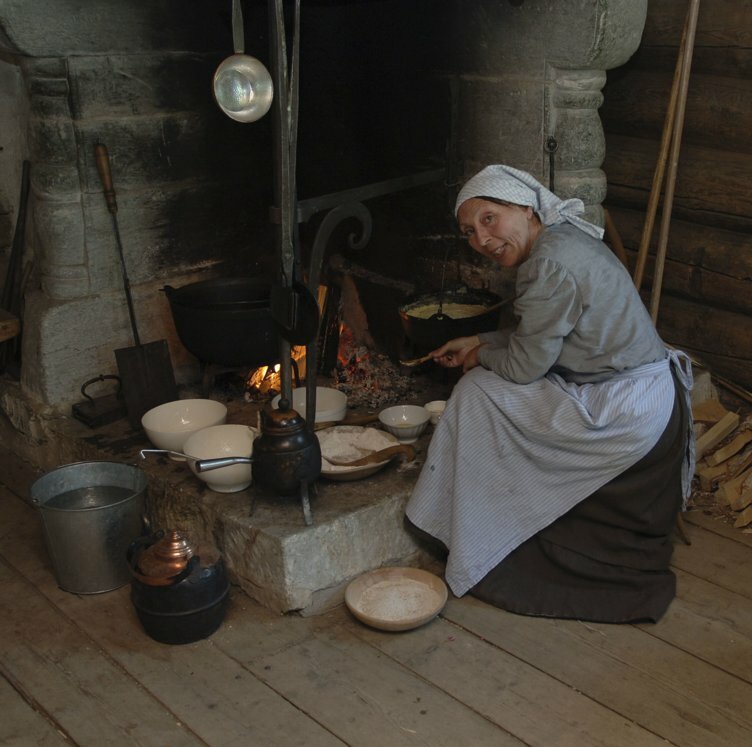 By having smaller rooms to keep warm, they were able to save a lot of wood. The people at the farm were excellent craftsmen, as can be seen around the farm. The summer and winter houses both have extraordinary nice wrought iron fittings on the doors, made by the farmer Kristen Rasmussen Øygard. The furniture in the winter house is made by Rolf Kristensen Øygard (1747-1809); he was a very experienced carpenter, smith and wood carver. The Kårbygning (housing parents and unmarried siblings) is small and located at the top end of the yard. This was used at one time to house a travelling school teacher. The Stabbur (food store) lies in the middle of the yard and forms the division between the inner and outer yard. Around the outer yard you find the cow shed, stable, byres, barns and hay barns. The bed for the milkmaid is inside the cow shed. She both worked and lived with the animals. In this cow shed they had a manure cellar in order to keep the place cleaner than the older type of byres. The smithy, the cook-house and the drying rooms are located in the outer yard to avoid fire in the main houses. Open fires were burning in these houses, and this made a fire hazard to these houses and other houses near by on the farm. The mill is located at quite a distance from the farm. This due to the need of having a fast running stream. Øygarden at Maihaugen Øygarden takes its name from the time of desolation following the black death. Photo: Kåre Hosar/Maihaugen. Summer has come to Øygarden. Photo: Maihaugen. The farmer’s wife by the fireplace at Øygarden. Photo: Camilla Damgård/Maihaugen. 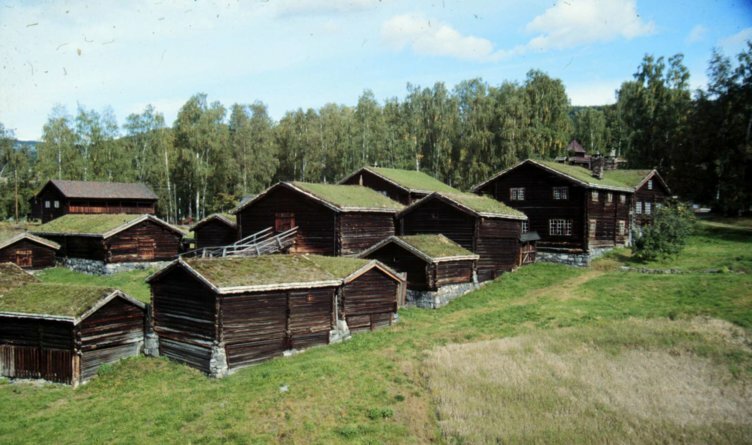 Overview of Øygarden, a middling sized farm with 19 buildings. Photo: Camilla Damgård/Maihaugen. 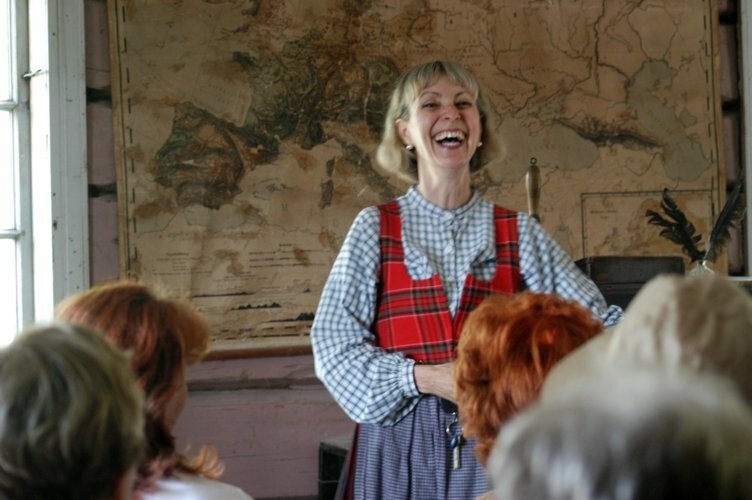 Visit the School House and participate in a school lesson from past times. You might have to stand in line to enter the building, girls and boys separately. Beware to walk nicely and sit down on the correct side. If you are a noisy student, or haven’t done your homework, you might have to stand in the corner as punishment. The new Education Act came into force in 1860, and the hamlet schools were a result of this legislation. Permanent schools were built as a replacement for the travelling teacher system, where the teacher went from one hamlet to the next and taught at the farms. Øygard School was built in Skjåk, close to Øygarden, shortly after the law came into force. The Education Act also altered what was taught. The school year became longer and the number of subjects was increased. Previously, mother tongue, arithmetic and Christianity were the dominant subjects, but now biology, geography and history were added. Knowledge of the world and awareness of just being one country of many in the world, was awakened. Wall charts and maps were used to illustrate this. Democracy was introduced by the Constitution of Norway in 1814, and local democracy by the Body of Aldermen Act in 1837. This led to the need for knowledge among the people, since the right to vote was extended. Society was also undergoing a change. Everyday life in the village was changing into more specialised work, where education mattered. The School House was built during the 1860's at Øygarden in Skjåk. Rebuilt at Maihaugen in 1912. The School House is in a beautiful location at Maihaugen and is always open in the high season. Photo: Kåre Hosar/Maihaugen. 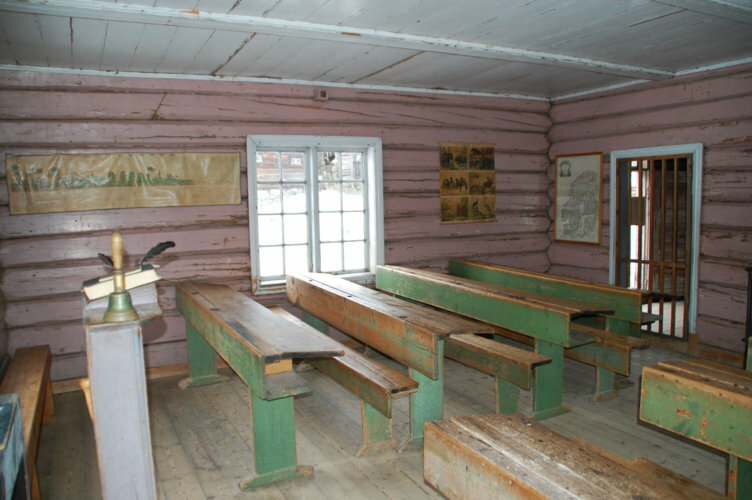 Taken inside the School House at Maihaugen. Photo: Kåre Hosar/Maihaugen. It is very informative to experience a school lesson from the past. Photo: Esben Haakenstad. Happy teacher in the School House. Photo: Cecilie Owren.